How are we supposed to react to today’s news that Cleveland Browns wideout Josh Gordon was denied reinstatement by the NFL? Surprised? Angry? Let down? To be 100% honest, I heard the report and barely flinched. I’m going to take a leap and assume the Browns responded the same way. There might have been some secret hope within the front office that maybe, just maybe, Gordon was going to be cleared to return. Cleveland would then get the luxury of having a Pro Bowl wideout to work with, a nice bonus after the team lost 2016 standout Terrelle Pryor in free agency. At the end of the day, though, that’s all Gordon really was. He wasn’t someone the team was depending on. He wasn’t a player the front office was trying to build the offense around. He wasn’t under consideration for any sort of contract extension. 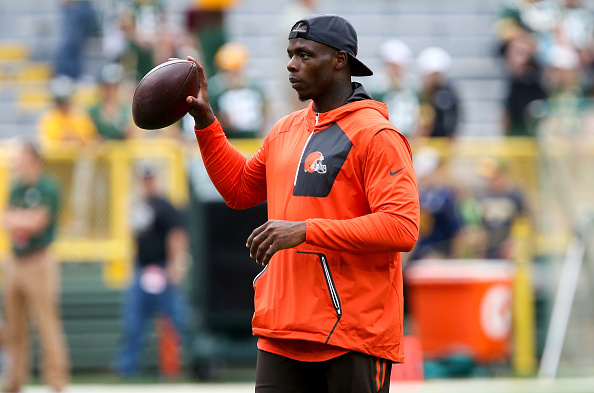 Josh Gordon was merely going to be a bonus, added value the team was likely barely even considering until he was given the green light to play football again. That he was denied isn’t detrimental for the Browns, as they likely weren’t even planning on his presence in the first place. It sounds cruel, sure. However, could you blame Cleveland for seeing Gordon as anything but an afterthought who might be available? We’re talking about someone who hasn’t played a regular season game since 2014. Gordon has been in the NFL since 2012, with his rookie year also marking the last time he played a complete season. Since then, his career has been littered with suspensions, from a two-game ban in 2013 to a complete expulsion in 2015. Though his comeback looked to be in full-swing last year, he stepped away to head to rehab just one week before getting reinstated. It’s tough to look at a player with such a checkered past in the league and see him as a crucial member of the roster. As a result, I highly doubt the Browns took today’s news as a major blow. Why would they? Do you really think Cleveland would’ve celebrated had the story been the opposite, that Gordon had been reinstated? He was reinstated last year and didn’t touch the field in the regular season. He had his suspension cut short in 2014 and got exiled a good five weeks later. If history tells us anything, Gordon’s being reinstated only provides him another opportunity to get suspended. So, while you might think his failed attempt to get back on the field is an egg-in-their-faces moment for the Browns, you’d be wrong. Such a scenario would imply Cleveland actually planned on having him in tow in the first place. But if the Browns weren’t actually expecting him to be available this year, why not cut him? It’s a valid question, but one you can answer when again realizing how this team only viewed the troubled wideout as a boon at best. Gordon is in the final year of an incredibly team-friendly contract. He’s not carrying a massive cap-hit, so cutting him wouldn’t give the team a ton of relief. As a result, Cleveland didn’t have to get rid of him. Waiting to see if Gordon finally had his head on straight, while ill-fated, didn’t cost the team much. On the off chance he was indeed staying on the straight and narrow, the Browns would have a record-breaking receiver available who came with a laughably low $1 million cap hit. While it made no sense to cut him, it also made no sense to depend on him. This is why today’s news likely had a minimal effect on Cleveland’s 2017 plans. The lack of talent at wideout is still concerning, sure. At the same time, there’s a 0% chance Gordon’s name was on the Browns’ depth chart before news broke of his failed reinstatement. He can reapply again in the fall, and I’m willing to bet the Browns will take the same route. If he makes it back, great. If not, no skin of their backs. That’s just how you treat a bonus. You don’t account for it, but if it comes along, it’s a nice reward. The same can be said for Gordon’s hopes for reinstatement.